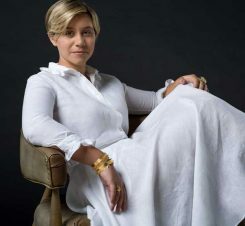 When it comes to tastemakers, Danielle Rollins has cornered the market on Southern hospitality. The Atlanta-based interior designer, author and entertaining expert established herself as the South’s most formidable hostess with “Soiree: Entertaining with Style,” a Rizzoli book documenting some of her most lavish and memorable parties. Who better, then, to launch a collection of hostess-ready clothing? 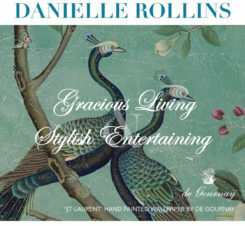 Danielle, who also serves as a contributing editor at Veranda, recently debuted a line of dresses and separates at danielledrollins.com with hostess duties in mind. To accessorize her collection, she selected a few pieces from MEMO for a recent photo shoot. Here, we chat with Danielle about her jewels, her new collection and her ultimate style secret. Tell us all about your clothing line. 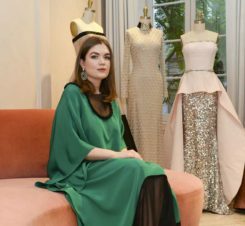 Why did you launch a collection? What is the inspiration behind the collection? Where can we buy it? I am passionate about style and found that I love creating beautiful environments but what I loved most was watching that twinkle in someone’s eye when they develop their own sense of style. Contrary to many opinions, I do think style can be taught – and caught. I like a very restrained elegant look with a fair amount of comfort and flexibility to wear multiple ways for many occasions. I wasn’t always inspired by what I was able to find in retail, or if I found it, it was a temporary solution until the next whim of season. I started making pieces for myself or remaking vintage pieces I had worn to tatters and people loved them. The clothing line really wasn’t something I planned, it just popped up a result of demand. I have always thought about doing it and wanted to do it, but I look back now and think I can’t actually believe I did it. How would you describe your personal style when it comes to both fashion and jewelry? I have a very classic, all American effortlessly elegant style that is easy to wear, with a dash of whimsy & a little fantasy thrown in every so often. I like for my clothing to be the bckground structure to set off my jewelry. You selected several colorful earrings from Memo to accessorize your clothing. Tell us what spoke to you about these pieces. 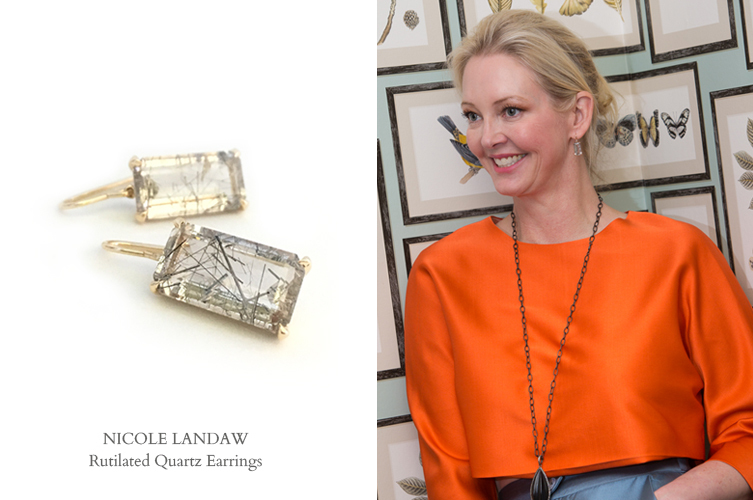 I love Nicole Landaw’s Quartz Drop Earring because it hits just at the point of the jaw to frame your face. 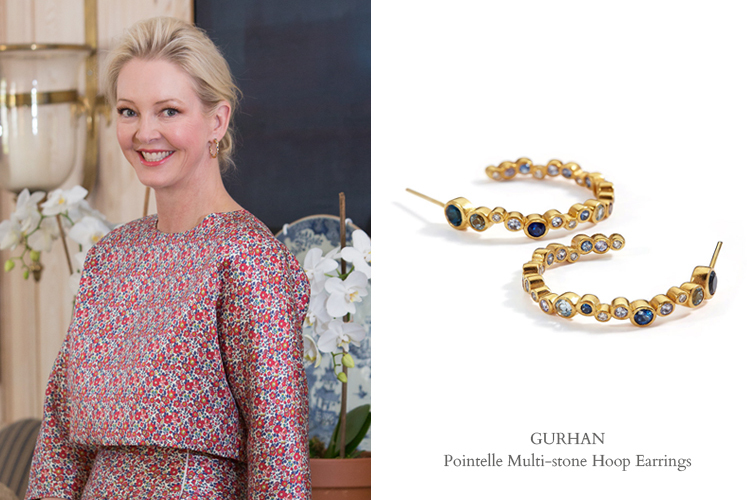 And I love pieces that have just enough restraint for day – like Gurhan’s Pointelle Hoops – but can be combined with more jewelry to give maximum impact at night. Earrings are my go to, and I love a beautiful armful of stacked bracelets and large scaled rings. And I love color. 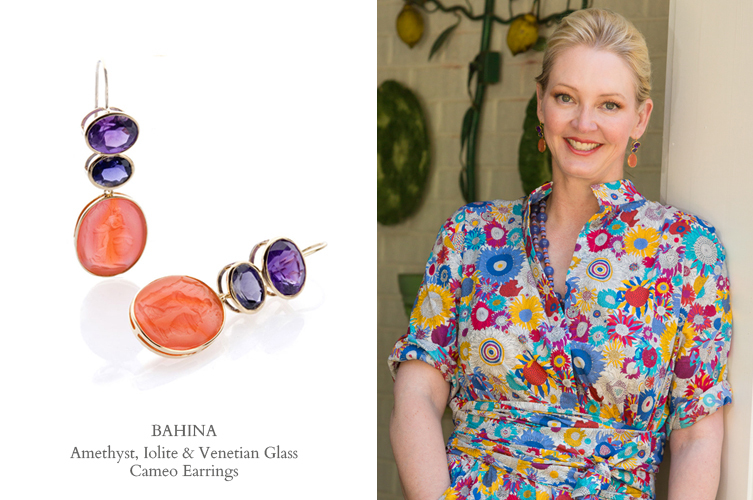 Stones like the ones in Bahina’s Amethyst, Iolite and Cameo Earrings have this wonderful warmth to them that radiates in a way nothing else does. How would you wear the Memo earrings with your collection? All of my pieces are designed as “background” pieces so the wearer is what stands out, not the clothes. The necklines are created with thoughts of how with a combination of jewelry would look with the piece, so that an individual can look good with only earrings, or layer on the full on ensemble of necklaces, bracelets and rings too. You have a very busy social calendar and always look incredibly chic. What is your secret? Any wardrobe or styling strategies that you can share? I never take longer than 30 minutes to get dressed, and I think less about what I look like and more about how an outfit makes me feel. I don’t buy things if they’re complicated or trendy or go with something existing in my repertoire because I detest spending time looking for a certain top or pant to force an outfit. I don’t buy anything I can’t wear a flat and a heel with. I believe alterations are the key to looking good no matter who you are so a good tailor or seamstress is important. Where do you see yourself and your clothing line in five years? Some days when I think about the last five years, I think, oh my gosh look at all that I have accomplished! And other days I think, oh my gosh, is this all that I have accomplished? I couldn’t have imagined right now five years ago, but I worked for it with a passion that can only come from doing something you love. I hope that I have ability to scale to produce larger volume distribution in both clothing and home so it is accessible to more people. I want to continue to find that twinkle in someone’s eye when they walk into a room that gives them joy or put on a piece of clothing that makes them feel beautiful! I have expanded my business 100% & we are bursting at the seams, it’s stressful, it’s scary, but it is also so much fun & I wake up happy!